When Aaron, Israel’s first High Priest, died his son Eleazar became the High Priest. The book of Numbers says that Aaron died on the mountain top of Mount Hor. “Take Aaron and his son Eleazar and bring them up to Mount Hor; and strip Aaron of his garments and put them on his son Eleazar. So Aaron will be gathered to his people, and will die there.” So Moses did just as the LORD had commanded, and they went up to Mount Hor in the sight of all the congregation. After Moses had stripped Aaron of his garments and put them on his son Eleazar, Aaron died there on the mountain top. Then Moses and Eleazar came down from the mountain. When all the congregation saw that Aaron had died, all the house of Israel wept for Aaron thirty days.” (Numbers 20:25-29, NASB). Deuteronomy records that Aaron died at Moserah (10:6), but it also records that he died on Mount Hor (32:50). We need not think of this as a discrepancy. The best solution that can be posed to this problem so far is that Moserah is probably a larger area that included Mount Hor. Thus it would be quite correct to declare that Aaron’s death was either on Mount Hor (Num 20:22–29; 33:38–39; Deut 32:50) or Moserah (Deut 10:6). (Hard Sayings of the Bible, 166). Mount Hor is identified traditionally with Jebel Nebi Harun in the territory of ancient Edom near Petra. 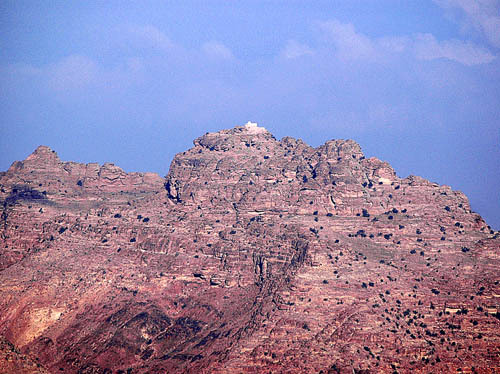 From the area of the hotels above Petra one can see the white Moslem shrine marking the tomb of Aaron on the top of Mount Hor. This photo shows the monument in the distance. The mountains reflect the typical color of the area around Petra.